The whole of New Hampshire is a Christmas festival during the holidays - with annual parades, music & caroling, train rides with Santa, and old-fashioned New England family fun. It's a winter wonderland at Ice Castles in Lincoln. 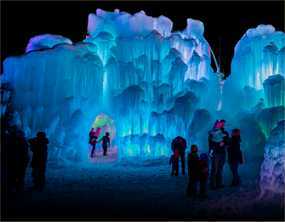 • Dress warm and line up for admission to to Ice Castles in Lincoln, New Hampshire to join the crowds who visit every holiday season. Visit around dusk to see how the sunset works its magic on the ice, or stay until after dark for the full-scale LED light display. • Come for the Santa Shuffle (featuring thousands of runners in Santa suits) then stay for the Light Up the Holidays Christmas parade, the state's largest holiday parade with more than 80 floats heading down Elm Street in Manchester. • Celebrate Christmas in days of yore at the New Hampshire Farm Museum in Milton, NH, where you can travel back in time to roast chestnuts over an open fire -- and experience the holidays aboard an honest-to-goodness one horse open sleigh. • The little town of Bethlehem NH (pop. 2,526) is big on Christmas, featuring meetings with Santa and craft workshops with Mrs. Claus. But the busiest section of town is the post office. It processes more than 50,000 pieces of mail every year from visitors who want to see their holiday mail hand-stamped with a "Bethlehem, NH" postmark. Nashua Winter Holiday Stroll - A major New Hampshire happening includes a Christmas parade, the arrival of Santa, Christmas tree lighting, the Festival of Trees, and holiday music & entertainment. The Gift of Lights at NHMS - Pile everyone in the car for a dazzling 2.5 -mile drive-through at the New Hampshire Motor Speedway in Loudon featuring 400 different lighting displays. Journey to the North Pole - All aboard with Santa on the Conway Scenic Railroad with November and December dates, times and ticket information. Ho-Ho Hobo Santa Express - There's more travel excitement beginning at Hobo Junction in Lincoln to Woodstock, for a scenic train tour with Santa and his elves offering hot chocolate and cookies. Check out the route map, ticket prices, times & schedule. Traditionally Yours, Jackson - Check out this year's schedule of events with a visit from Santa at the Enchanted Village (the Jackson Village Old Town Hall) and the Jingle Bell Chocolate Tour by horse-drawn sleigh. Santa's Village - This is one of the Jefferson area's top attractions year-round, with information on special December events, admission prices and nearby hotels and lodging. Remick Museum Christmas - In Tamworth, step back in time for old-fashioned holiday fun with traditional decorations, Christmas treats and craft activities. Christmas Tree Farms in New Hampshire - An extensive list of precut or cut-and-choose Christmas tree farms throughout the state with contact details, driving directions and related links.